​MWF and IFC recently completed a study aimed at improving sanitation practices and conditions among low-income families in the country. In this photo are IFC Director for Inclusive Business Toshiya Masuoka, IFC Associate Operations Officer for Inclusive Business Shino Saruta and MWF Chairman Ferdinand Dela Cruz. 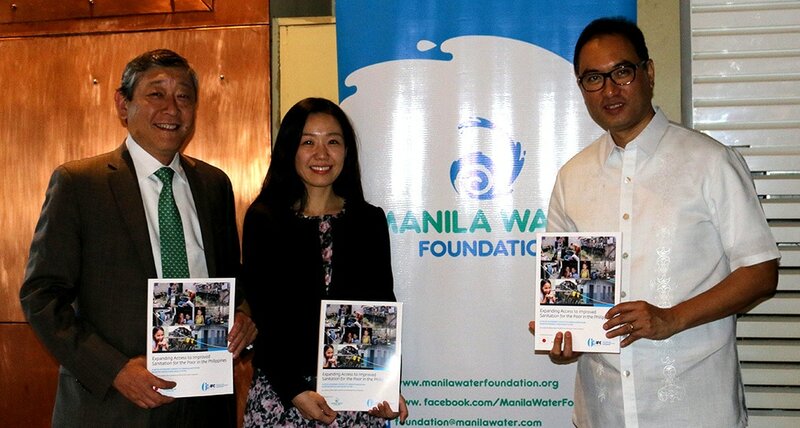 Manila Water Foundation (MWF) and International Finance Corporation (IFC) recently took a step towards improving sanitation among low-income Filipino communities. MWF partnered with IFC, a member of the World Bank Group, to conduct a study to develop pro-poor sanitation solutions and healthy sanitation practices in the country. The study aimed to further improve MWF’s local sanitation program, which has been one of the Foundation’s main thrusts since 2015. This initiative is aligned with the UN Sustainable Development Goal 6 which is to “achieve access to proper sanitation and hygiene for all and end open defecation”. Locally, it was also in response to the 2017-2022 Philippine Development Plan, which stated that 5.9% of the country’s total population are still in need of improved sanitation despite interventions from the government. The joint study was conducted in select urban and peri-urban communities in Metro Manila and other cities in the Philippines. Among the respondents who did not have private toilets, 9% still practice open defecation and 3% use chamber pots as an alternative solution, both of which pose negative health and environmental risks. Aside from these, respondents shared the psycho-social consequences of not having private toilets such as being the subject of gossip, having to get in line just to have access, and facing issues on safety. These were echoed by IFC Director for Inclusive Business Toshiya Masuoka who stated the different barriers to improved sanitation conditions. “The study revealed that almost every household that lacked proper sanitation wanted to improve their conditions. However, these households face a number of obstacles in improving their sanitation conditions such as costs, land ownership issues, and lack of space,” he shared. MWF Chairman Ferdinand Dela Cruz also emphasized the study’s expected impact on the lives of grassroots-level communities in the Philippines. “Our partnership with IFC in research and development is vital in realizing this pro-poor sanitation agenda. Having them on our side has helped us in developing our own brand of a sanitation program that uses a people-centric and context-based approach, recognizing that no single technology or solution can address the Base of the Pyramid communities’ sanitation needs,” Dela Cruz said. Aside from the joint study, MWF piloted the construction of a community toilet in Cainta, Rizal. The result was an eight-cubicle communal toilet facility in San Buena Compound built in 2015 that has since benefited more than 1,300 individuals.